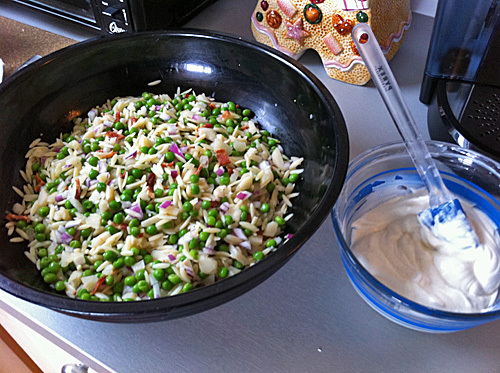 Pilfered Pea and Orzo Salad | Let's Cook With Bry! I call it “pilfered” because a friend of mine used to work at a popular restaurant that had this colorful, delectable salad on the menu, and I asked him for the recipe. That particular restaurant was part of a large corporation and, therefore, was extremely protective with its recipes, but my friend gave it to me on the sly – after I’d been sworn to secrecy. Thus, it’s pilfered, and this is the version that has been reduced down from restaurant-sized quantities (from gallons down to ounces). Dress to serve – i.e. 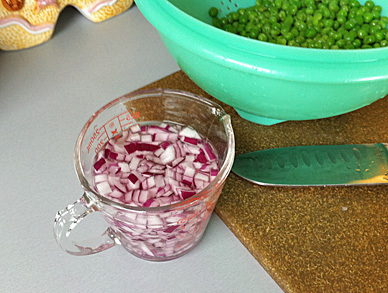 don’t mix the dry ingredients with the dressing until you’re ready to plate or serve it, so the peas will stay fresh and bright green.